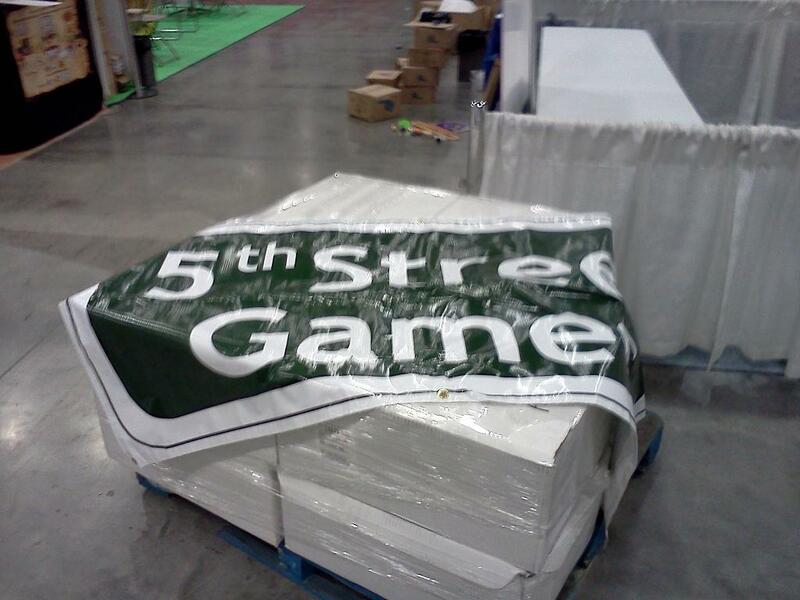 Phil Kilcrease is a former Purple Pawn contributor, who left when he started up 5th Street Games. 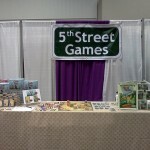 I invited him back to share with us his experience as a first time exhibitor at Gen Con. 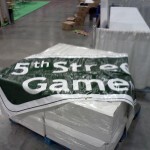 Gen Con! 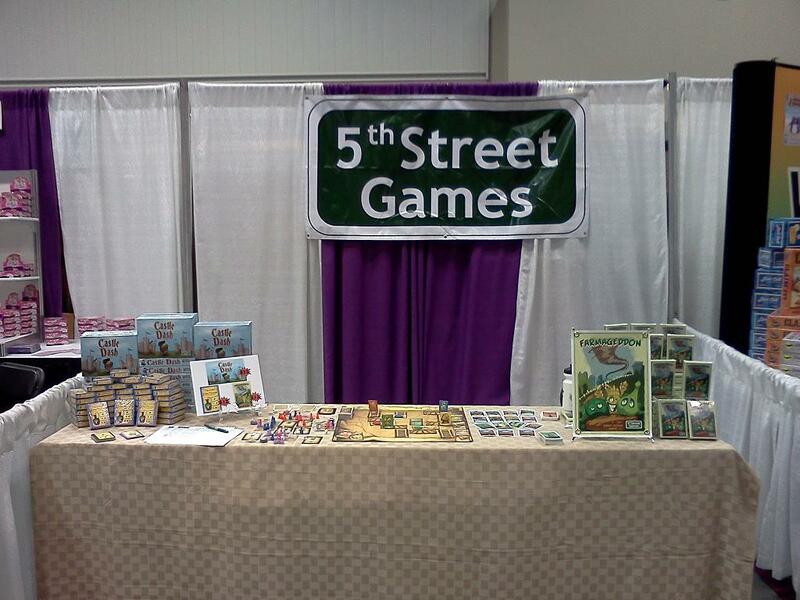 Four days of demoing and selling games. Oh yes. At smaller cons, interest is steady (in large part to the gaming room being in the same space as the retailer room). At Gen Con, though, interested gamers come in waves. I’m glad Farmageddon designer Grant Rodiek and my friend Randall were there to help demo games with me. There were times when there was a sheer press of interest that would have been overwhelming if it weren’t for their invaluable aid. Getting everything to and from the con was surprisingly easy. Fern Expositions set up delivery both ways, and all I had to do was pack up on either end. SUPER nice. 5th Street’s debut had us in row 200 of the Family Fun area. Traffic was overall steady, with the title Farmageddon and Jungle Ascent’s prototype attracting people to stop by and check us out. We also participated in Cheese Weasel’s scavenger hunt, which brought by a fair number of people, too. 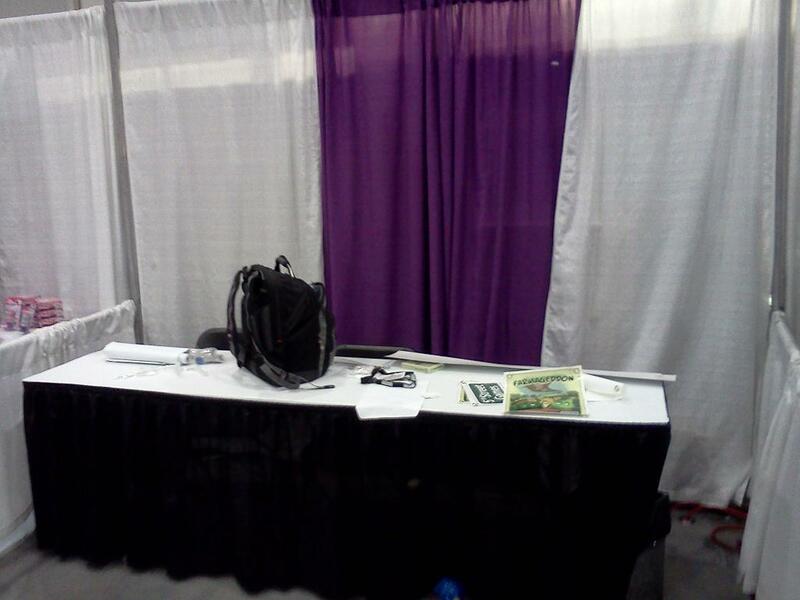 When in a booth during a convention, pitching and demoing your games consumes you. Within the first couple hours, I had refined the Jungle Ascent and Farmageddon pitches far better than they have been in a long time. Down side to refining your pitch? Driving your booth neighbors crazy in giving it again… and again… Not that I got complaints (or had any myself); both Bella Serra and Wattsalpoag were both most excellent neighbors. 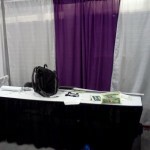 Have a snazzier booth with better fixtures and decorations. Don’t overship product to the con. We overestimated demand and had to ship it back home. I’ll have a better idea for next time, though. All in all, it was a great time. I look forward to goin’ back; I’ll be ready! Any idea how many units you should have brought instead? @Daniel: About 100 Farmageddon, and 25 each of Castle Dash and Crow & the Pitcher.